The week is coming to a close and the time has finally come to review Shadowland #2. If you’re trying to avoid heavy spoilers, I recommend that you read the review I wrote for The Weekly Crisis instead. Here, I’ll be getting into the details a little more. All good? Then let’s get rolling. In many ways, Shadowland #2 is much more enjoyable than the first issue of the event. The pacing is better, there are more things going on, we see Moon Knight being introduced in very entertaining Prison Break fashion, and the art is much better. Last issue, I felt that Billy Tan was doing this event a disservice, but in this issue I not only don’t mind the art, I actually enjoy it. So, why would I rate this issue lower than I did Shadowland #2? Well, it’s not so much what happens in this issue as what doesn’t happen in this issue. There’s still that pesky gap between the events of Daredevil #507 (the final issue of the Left Hand Path arc) and the events of Shadowland #1 that makes it difficult to really get as invested in the story as I would have liked. This was easier to overlook in the first issue, but as time goes on, you’re beginning to wonder if this will ever be addressed. We will surely learn what has lead Murdock to this point, but I would have liked to see more of the how. I’ll return to this topic or, more specifically, the general state of Matt Murdock further down. For now, let’s get back to the issue and all the things I really did enjoy about it. The first thing that happens this issue is Moon Knight cleverly injecting himself into the story, and his scenes are excellent. I’ve never really read Moon Knight outside his Civil War tie-in (and his Secret Avengers appearances), but what we see in this issue is enough to make me really excited for his three issue Shadowland mini-series. Here, we see Marc Spector score himself an invitation to the Shadowland dungeon by smashing his cab and wait for the ninjas to show up and drag him off to jail. At the end of the issue, we reconnect with the character and see that he’s got both a clear agenda and a few tricks up his sleeve. Very cool. Next the issue cuts to a slightly less compelling scene featuring a conversation between Danny Rand and Luke Cage in Rand’s soup kitchen. I can see what Diggle is trying to do here, but it feels a tad uninspired and I’m thinking the scene could have possibly been cut for length. In any case, this sets the scene for the Kingpin to make an appearance with Lady Bullseye at his side. It’s been hinted at before that Fisk is up to something, but here his request is very direct: that Danny and Luke need to dethrone their megalomaniac friend. Daredevil gets more quality screen time this issue than he did in Shadowland #1 (it at least feels that way), and his first appearance here features a character we haven’t seen in a while in Black Tarantula. The reader knows that he is likely the only character inside Shadowland who still has all his cups in the cupboard (as the Germans put it) and here we witness his shock at learning that Daredevil has plans to expand his operation. It’s clear that Matt has adopted a very divisive view of the world and the people in it, though his exclamation that “if they’re not with us, they’re against us” feels just a little over the top. Next up we have the Kingpin and Lady Bullseye using an ancient Japanese scroll to summon the “zugaikotsu warrior.” The identity of this warrior is only hinted at here, but is revealed at the end of the issue to be none other than the Ghost Rider as he literally crashes into Shadowland, sending the whole place into a frenzy and setting up the issue’s cliffhanger ending. I wasn’t thrilled to learn that Ghost Rider would be involved in Shadowland. Mostly because I think the premise of the character is utterly ridiculous. However, if he had to be included (and the event concept seems to require that as many characters as possible be involved), this is a pretty cool way of introducing him. There’s been quite a bit of discussion regarding how an old Japanese scroll is able to summon the Ghost Rider, but after spending some time on Ghost Rider’s Wikipedia page, the concept may not be completely far-fetched, particularly not with the obvious hints to concept of vengeance. A quick Google search also revealed that zugaikotsu is the Japanese word for skull or cranium. Well played, Mr. Diggle. 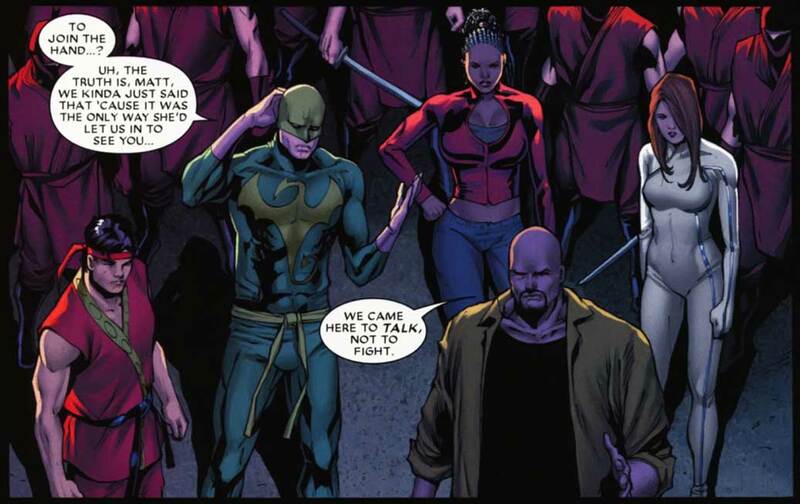 Gathering fellow heroes Misty Knight, Colleen Wing and Shang-Chi, Luke and Danny manage to persuade White Tiger to let them in to see Matt, under the pretext of wanting to join the Hand. This “intervention” scene is one I mostly approve of, but it does highlight the biggest problem with Shadowland so far which is that Matt’s behavior is not only hard to make sense of, but that he comes off as the least interesting character of the bunch. Much has been made of the idea that Matt is possessed by something, and that this is to be considered as some kind of cop-out. I don’t agree with this. The fact of the matter is that having Matt Murdock go into full villain mode without being nudged in that direction by something would be wildly out of character, which is something people tend to overlook. On the other hand, Diggle has been pretty clear about Matt’s own part in his downfall. Whatever mystical darkness that has entered his mind had to have been invited in, and it is clear that no entity has kicked Matt out of his own body. He’s in there, perhaps not totally in control, but very much aware of his own actions, and as this issue shows, is still desperately trying to mount a psychological defense against all the destruction he’s causing. Considering the basic premise of the event, I’m not sure sure that the slight frustration I’m feeling regarding the handling of the Daredevil character is a consequence of poor writing – on the contrary, I can’t think of how else to approach it – so much as the fact that this kind of story must be incredibly difficult for a writer to pull off. While I’m still very much enjoying this event (and last month’s Daredevil was an absolute treat), I can’t help feeling that there’s a design flaw at work here that gives this event a slightly awkward feel. Shadowland has yet to pass the halfway mark, and my hopes for an engaging story remain high. 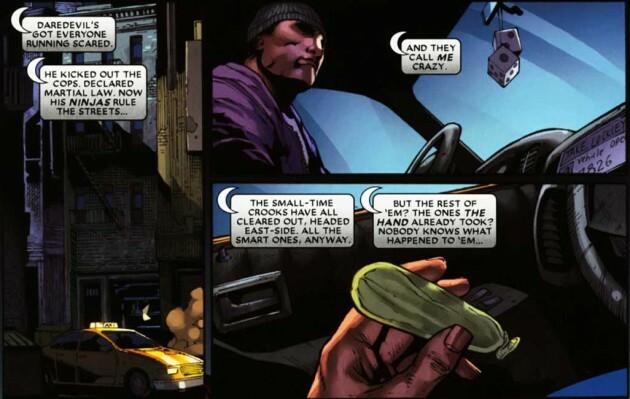 But there is a gnawing concern on my part that there may not be a right way of delivering a perfectly credible story portraying Daredevil’s descent into villainy without either short-changing the story or stretching Matt Murdock’s character to new extremes. I have no doubt that Shadowland will end up being a great read, particularly when compared to most of the events we’ve seen over the last few years. I’m just not convinced that it will end up being a great Daredevil story. I can live with that, but let’s hope that Diggle will pull this off and give us both. The end for Daredevil. Or is it? It always gives me great pleasure to read your posts, because you neatly craft all the words I want to say. Agree heartily with everything, not a dot to add. Great review! You hit all my likes and dislikes. I was pleasantly surprised by the art. I can’t foresee myself becoming a big fan of Billy Tan’s art, but this issue was MUCH better than Shadowland #1. I’m in for the long haul, but I want at least *hints* of an answer, otherwise the “big reveal” doesn’t feel organic, but forced. Perhaps I’m not bright enough to see the ones Diggle and Johnston have given us, but it feels like there’s been nothing in that direction so far. I’ll place what hopes I have remaining in Daredevil #509, and then in Shadowland #3, and then in Daredevil #510, etc. (1) Matt is possessed and controlled by the Beast. This isn’t ideal, but it does remove all moral culpability from Matt and allows Shadowland to be swept under the rug immediately with few repercussions. (2) Matt has gone nuts. This is considerably worse than (1) since it seems to have been precipitated by nothing. There’s no trauma that would have seemingly turned a pretty in-control Matt from Daredevil #507 into the nutso Hand leader in Shadowland #2. It also nearly prevents Matt from ever resuming his former status in the Marvel Universe. He would basically be a full-blooded crazy villain. (3) Matt is pretending to be nuts in order to infiltrate the Hand / acquire some information / accomplish some goal that is hidden from us at the moment. This is a common-enough technique in comics that I wouldn’t be surprised to see used here. Matt reveals that what he was *really* doing was _____ and he needed to fool all his friends, the people of NYC, and the leadership of the Hand in order to accomplish it. ______ had better be pretty big to justify Matt having now committed so many crimes that he’s facing something like 8000 life sentences at Ryker’s Island. Also, the construction of Shadowland better have been the most reasonable means of accomplishing ______, and not just an ad hoc rationalization of his crazy actions. (4) It’s not Matt. While similar to (1), it could always be the case that that isn’t really Matt and Matt is off elsewhere as a prisoner or orchestrator of events. Skrull, anyone? Pretty unlikely. (5) Some combination of the above. Clearly the most likely. Are any of these choices that I would like to see taken? If these are the only options for this story’s resolution (broadly), can this story make me happy? I’m really not sure. At this rate, Shadowland may end up being Daredevil’s version of “One More Day”. If the ending is polarizing enough, people will drop Daredevil and act as if any issue following Shadowland didn’t happen. I hope I’m wrong, but the plausible solutions seem to be few, with no desirable resolution. Robert, the conversation you mention sounds like the exact conversation they must have had when they came up with Siege. Just like Shadowland, Siege was so out of place and forced that the event was laughable. I’m sure they looked at the Blackest Night sales figures and said “we’re getting destroyed by DC’s zombies! Why don’t our zombie titles sell like theirs?! Quick, Bendis, think up an event to compete. Who cares if it makes sense. Quesada says to use the excuse “it’s magic” when things make no sense”. This ending had better fill in the gaps in logic and not ruin Matt Murdock/Daredevil. I’m still trying to be optimistic about the event, but I do have concerns. DD’s “One More Day”…..uhhhh, *SHUDDER*. I really hope that doesn’t happen. I gave up on Spidey after he revealed his secret identity in Civil War, I don’t want to lose DD too! Well, I guess my best contribution to this discussion is to answer Aaron’s question. How do I remain so optimistic? First of all, while I do see problems with how this event is set up and what it might mean for Matt Murdock, I still see potential with this storyline. Secondly, I’m just one of those glass-half-full kind of people. I’m naturally optimistic and I prefer to give people, including comic book writers, the benefit of the doubt, particularly when it comes to a work that is not only still in progress, but has yet to even reach the halfway mark. Do I have concerns about where this story might go? Sure, but as it can still go either way I’ve decided to not worry unnecessarily. As my dad puts it, if you worry about something before it happens, you will have worried at least one time too many. There’s also another thing. Many months ago, at the beginning of Diggle’s run, I voiced some concerns I was having on Twitter, regarding what might happen to Matt. Diggle responded with a tweet that put my mind at ease. I remember the gist of it, but can’t quote it. However, I think he may have felt that he might have said too much, because the tweet was deleted a little while later. Needless to say, I won’t discuss it here, precisely for that reason (I would make for a horrible gossip journalist), but things along the same line have been voiced in interviews as well. If you go back and read interviews with Diggle from early this spring, there is a definite sense that he’s got plans for Matt beyond Shdowland that don’t sound like something out of a comic book fan’s worst nightmare. In fact, there’s a lot of talk about realizations Matt is about to have that really give you a sense that there will be some real character growth somewhere at the end of the tunnel. When it comes to the teasers, I’ve been pretty open about my annoyance with them (I even got into a longish exchange about this with a Marvel staffer the other day on Twitter – where apparently all the interesting stuff happens ;)). 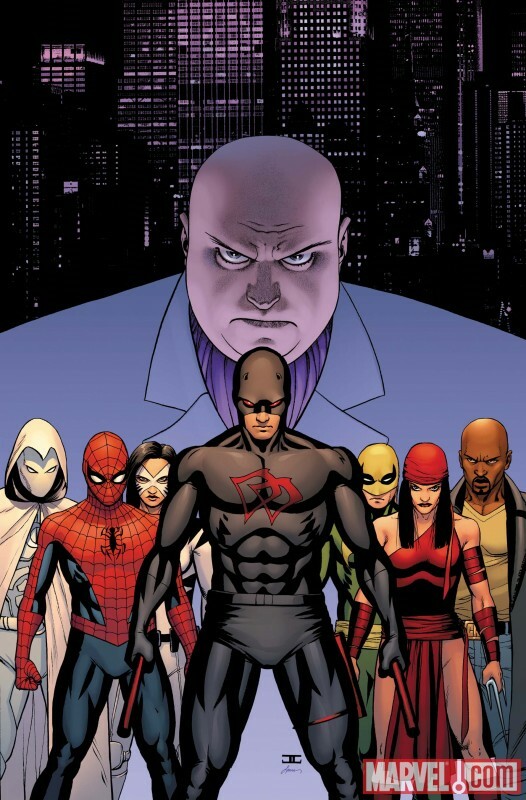 My problem with them is that if any of them, especially looking at the characters they’ve lined up so far, are “real” in the sense that they will come anywhere near the Daredevil title, I’ll be one miserable fan. If they’re not real, and I still smell red herring here, that’s almost as bad. Because it smells of hype for the sake of hype. I know Marvel does this kind of thing all the time, but I think they’re underestimating just how many Daredevil fans read Daredevil specifically because he’s not usually subjected to this kind of hype. If the various superhero titles are likened to movie genres you could say that the Avengers titles are the big summer action blockbusters, and Daredevil is the moderately successful independent movie that the critics like. Maybe this makes us DD fans a bit pretentious in that “Daredevil is no typical superhero!” kind of way, but it also means that using summer blockbuster hype to sell a title to people who prefer the small-budget independent movie they’ve become accustomed to is not necessarily a recipe for success. I was kind of excited about this event…now I am somewhat fearful of what the “brain trust” at marvel is doing to my beloved character. Marvel have had a history of creating un-needed upheaval with their characters. For a time it appeared to me that their idea of making something fresh was to slap a couple of double D-cups on a character and call it “new” (black panther is the most recent one that comes to mind) rather that trying to create an awesome storyline that brings the fans in Ala Kevin smith’s run on DD. I certainly hope that they are not trying to give us a “new” man without fear…as none and I am pretty confident in saying it, NONE of us DD fans will so much as acknowledge the book anymore. They must realize this and that is why I suspect that all will be okay in the end….Marvel does not want to lose our business after all. Well I wouldn’t call Kevin Smith’s run an awesome storyline, I agree it seems that they seem to just be trying to make a marvel melee in New York with loose plot threads that they can use to say “Yeah it makes sense see look” when in reality all they care about is making all the characters fight. @sacha: Are you suggesting Elektra will take on the DD mantle? They sort of did the same thing with Iron Man, as I understand Pepper has her own suit now. They’re one member away from becoming the Iron Force or Iron Man Corps. Sometimes it seems as if Marvel are doing the same sort of thing as DC with multiple characters in the same family (Flash, Batman, Superman, etc.). Recently Marvel beefed up their Hulk roster, which can be fun and interesting to some degree, but when you’re re-naming the title to Incredible Hulks, and expanding on a back-up story that wasn’t terribly interesting…it doesn’t sit well with me. That said, anything that says “Hulk” and “Pak” on the cover is always going to get my money. @Christine: Before Shadowland was announced, I remember reading an interview with Diggle that had the same tone and quotes as the one you referenced. I was loving every DD issue that Diggle was putting out, and figured we were in good hands. I’ll have to re-discover that optimism. Daredevil is not a legacy character. As long as Diggle realizes that, things should turn out alright. I thought Daredevil’s dialog was forced and unnatural. I agree that the “with us or against us” speech was over the top. Especially with his fist clinched and looking off into the distance. I was like, is this Daredevil or one of the Power Rangers talking? Since you haven’t posted your Daredevil #509 review yet, I’ll just say that I was quite miffed by the fact that it takes place prior to Shadowland #2, yet was released afterwards with no warning in Shadowland #2 to “read Daredevil #509 before reading this issue”. That always bothers me, especially when they could have prevented it from happening, but chose not to. Lazy Marvel. I didn’t post my review yet (I’ll hopefully have it up by tonight), but I did read the issue. While I was a bit underwhelmed by Daredevil #509 compared to the excellent #508, I don’t agree with you on this particular point. DD #509 doesn’t take place before Shadowland #2, it runs concurrently. Shadowland #2, Daredevil #509 and Shadowland: Blood on the Streets #1 all end in the same place in time. Maybe the issues would have been better served by coming out the same week, but I think it’s clear that the publication order is the intended reading order. I can see why you and others might disagree with me, but I wasn’t bothered by it at all. It’s just awkward to have Cage and Rand outside of Shadowland when we just read Shadowland #2 where they’re battling Daredevil and The Hand. What you say makes sense, but I believe it would have been more coherant if DD #509 was released prior to Shadowland #2. I didn’t buy Blood in the Streets. I’m only on board for the main title and the main event title. I look forward to reading your review of #509.